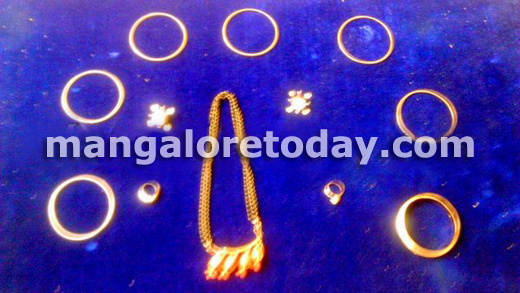 Mangaluru: September 4, 2015: The police on Thursday arrested a woman who was working as a maid in a house at Kankanady and also arrested her husband in connection with the charges of theft. The police arrested Parvathi (28) and her husband (42) both from Davanagere. According to the sources, on August 31, Shankari Rai, a resident of Kankandady had registered a complaint at the police station stating that her gold ornaments worth 48 Lakh which was kept in the dressing table were missing. The police started their investigation and began searching for the maid who was working in her house for three months and was missing since the day Shankari lost her gold ornaments. The police went to her rented house near Bajal find her, but the owner of the house said that she had left to Davangere on August 30. On the basis of credible information, the police went to Davangere and found that Parvati who was hiding at her relatives house. The police immediately arrested Parvathi and Puttaraju and seized all the stolen ornaments. It is learnt that Parvathi and Puttaraju were working in Mangaluru from Past 15 years. The duo were working for short time and then were changing the house without proving appropriate address. Might be they were planning from a long time. A pre -planned theft. We tempt them to do so, by being careless about our belongings. Thanks to the Man galore Police, luckily they didn’t harm any one but just robbed the jewellery and escaped. Well done Mangaluru police, Done a wonderful job by arresting the house maid and her husband. There are so many of such in the city, be careful the people of Mangaluru. We should be very cautious before appointing a house maid.We have seen many cases in the country but still the people want the house maids for less money and risk their life.